3. 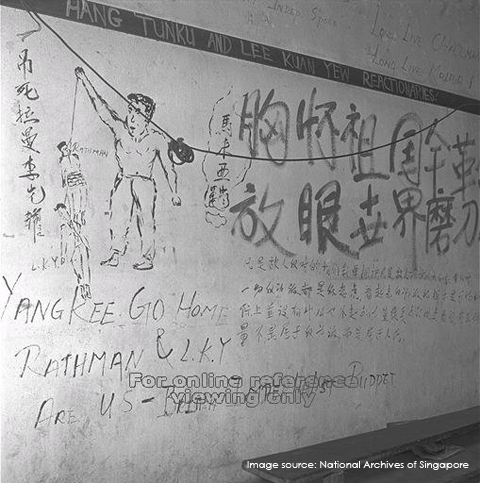 Street scenes of Singapore, c.1941. A non-descript road. Except for the taxis that used to ply the streets. The taxis of yore. Taxi services in the 1940-50s. Public transportation between the suburbs and the city center. The vehicle that is traveling on the road at the upper section of this film-still is a trolley bus. In the 1930s-40s, trolley buses were popular means of transportation. 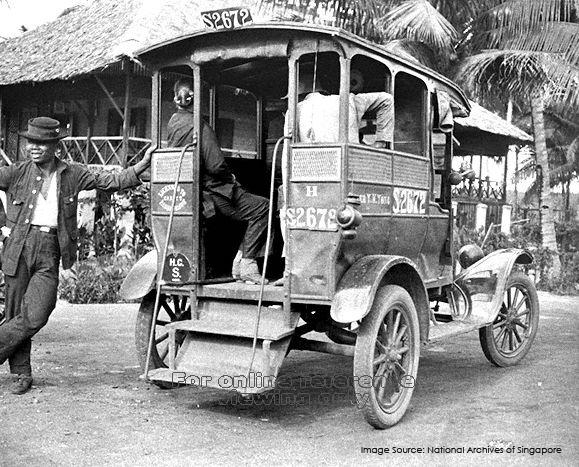 Earlier, electric trams that ran on tracks were phased out in favour of trolley buses that ran on rubber tires. The trolley buses were operated with electricity fed from overhead cables. In turn, the trolley buses will later be replaced by buses that run on fuel. 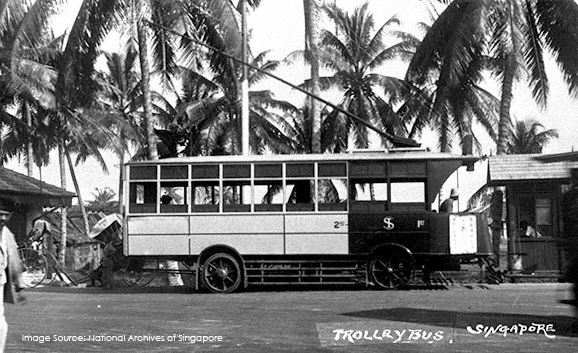 A trolley bus of the Singapore Traction Company, c.1930. A typical road junction of the 1940s. A traffic marshal – the center of attraction. A Sikh traffic marshal. 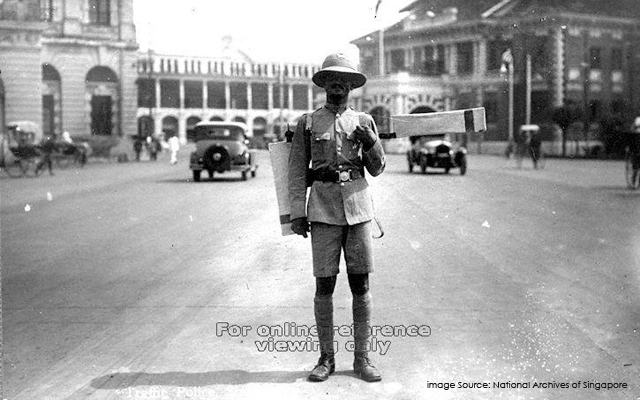 The traffic marshals wore rotan (cane) “arms”. c.1940. Traffic Marshal. 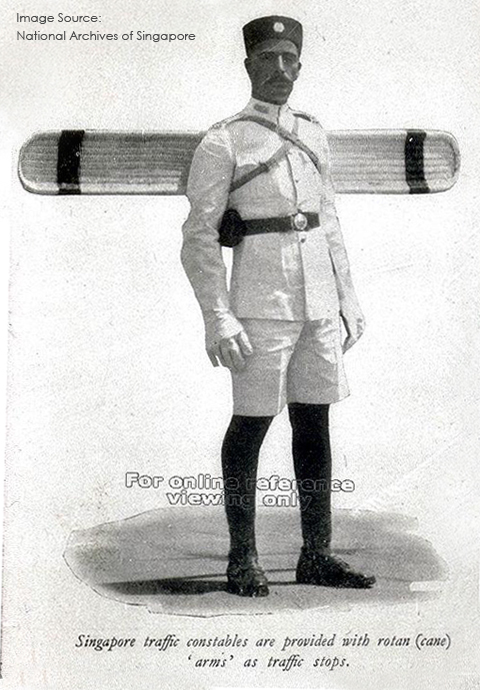 The “arms” were collapsible in earlier versions. c.1915. A rickshaw for two. Tough labour. 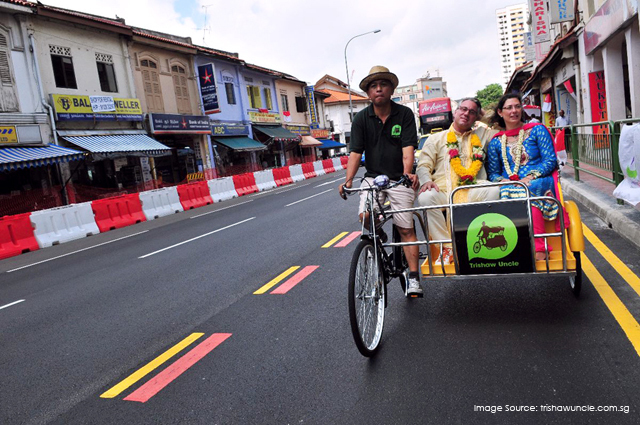 Rickshaws for tourists? The rickshaw-pullers wore numbers on their hats. Labourers for a rickshaw-tour-ride company? c.1940. Trishaws for tourists. The trishaw-riders wear uniforms. “Uncles” for a trishaw-tour-ride company. c.2010. 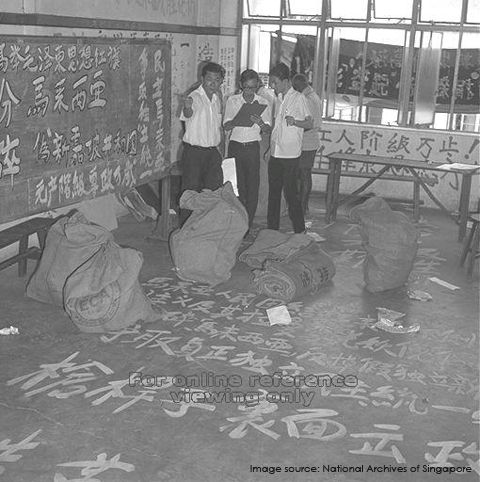 The Fall of Singapore. 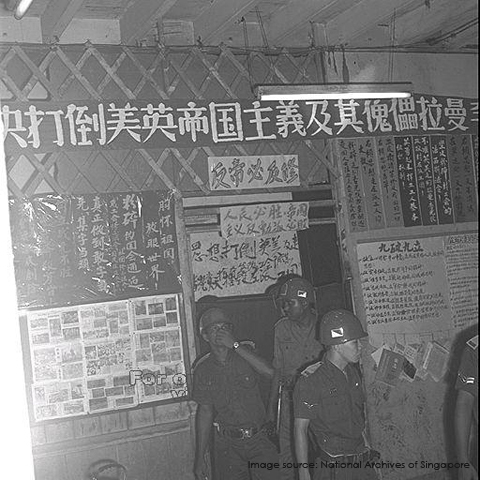 Japanese troops streamed into Singapore. February 1942. Japanese army tanks and the “bicycle brigades” advanced into the partially-ravaged city-center. The building with the distinctive facade was the Boustead Institute, at the junction of Anson Road and Tanjong Pagar Road. Soldiers on two wheels. The notorious “bicycle brigades” that stormed down the Malayan Peninsula and conquered Malaya in 55 days. The Fall of Singapore. Japanese army trucks. Can anyone identify the name and location of this bridge? Cavenagh Bridge, c.1941. Completed in 1869, it is the oldest surviving bridge in Singapore today. Rickshaws on Cavenagh Bridge. Boat Quay in the background. Boat Quay and Bullock Cart. Clarke Quay with sampans, bumboats, tonkangs and twa-kows. At the hairdressers. Hair Salon for the boys. Entertainment and recreation for the local masses. 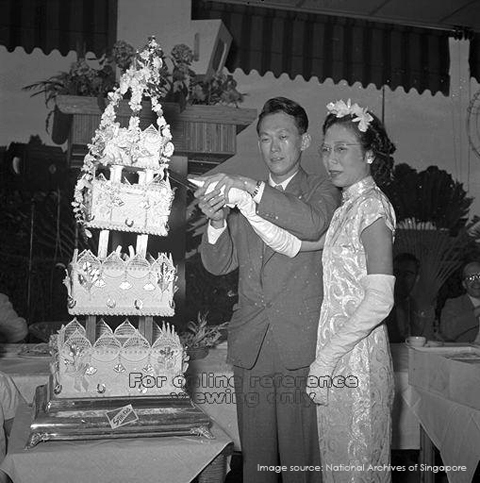 “Wayang” — a Malay word which translates into “theatrical performance” — often refers to the Chinese street opera in Singapore. It is a form of Chinese musical theatre that incorporates song, dance, acrobatics and martial arts. Street opera stages were often temporary and were built on open spaces during the festive periods. Entertainment and recreation for the colonialists. Sheltered patio dining area near the entrance to the Raffles Hotel in Singapore. c.1941. The Raffles Hotel entrance and the extended patio dining area. c.1941. The tower wedding cake was leaning towards them. Observe how Harry grabbed Geok Choo’s hand. As I work on this film project, I have enjoyed browsing through the photo collection on the National Archives’ PICAS website for images related to the filming locations or film-stills that I am presenting in the blog posts. And I always find myself drawn towards certain types of images – political leaders, places that do not exist anymore or have undergone drastic changes, strikes, protests, and “subversive” activities of various kinds. So, for this post, I felt compelled to present the following images that contained certain acts of socio-political “subversion”. These images surfaced after searching for “taxi drivers” and “hairdressers” in PICAS. The top banner in Chinese possibly reads: “坚决打倒美英帝国主义及其傀儡拉曼李光耀“, which translates into “Down with Anglo-American Imperialism and its Puppets Rahman and Lee Kuan Yew.” “Rahman” refers to former Malaysian Prime Minister Tunku Abdul Rahman. Pay attention to the caricatures of Lee Kuan Yew (L.K.Y.) and Tunku Abdul Rahman. 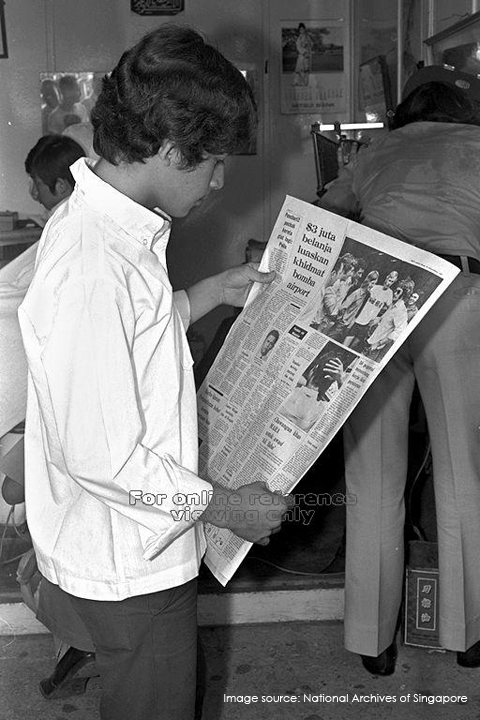 A search for “barber” on PICAS also called up this following image from the 1970s. We could have been called a “fashion-police-state”. What a name. Operation Snip Snip.